Gianna Beretta was born in Magenta (Milan) October 4, 1922. 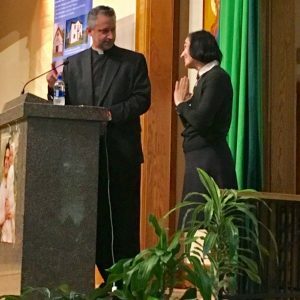 Already as a youth she willingly accepted the gift of faith and the clearly Christian education that she received from her excellent parents. 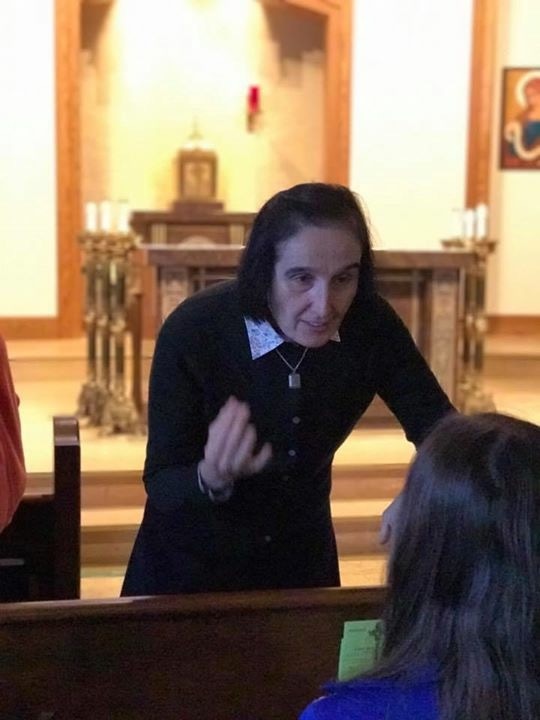 As a result, she experienced life as a marvelous gift from God, had a strong faith in Providence and was convinced of the necessity and effectiveness of prayer. 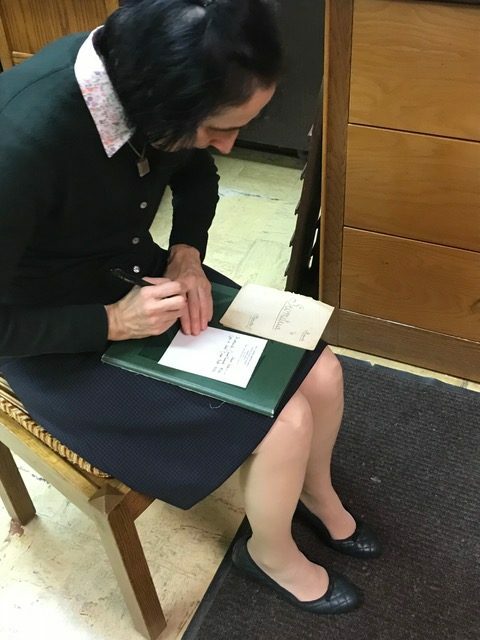 The following relics were gifts to the Collection from her daughter, Dr. Gianna Molla upon her visit to Duluth, Minnesota in October 2017. 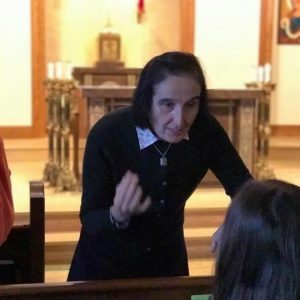 The artifact is a first class relic of St. Gianna Molla, given to Father Richard Kunst by her daughter, Dr. Gianna Molla during her visit to Duluth, Minnesota, October 29 – 31, 2017. 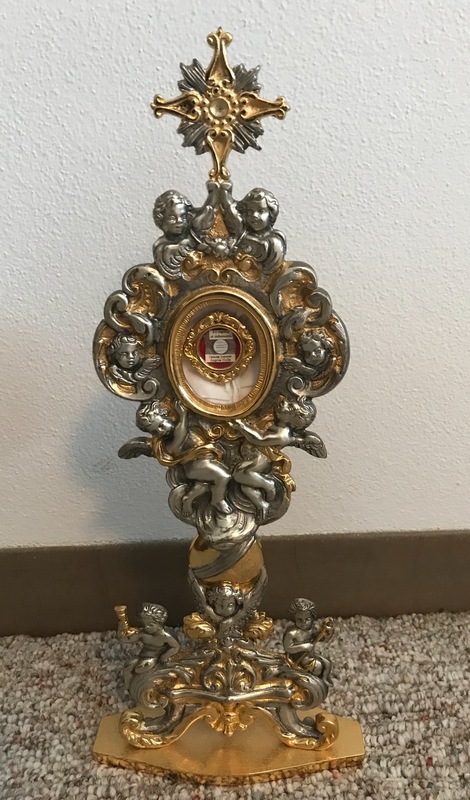 The relic is hair clippings from the saint. 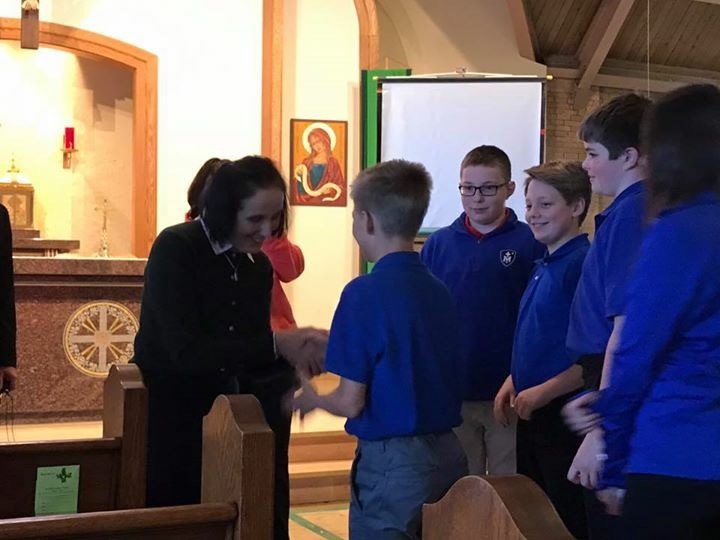 Dr. Molla gave several presentations during her stay, including to school children from the Catholic middle school, to the bedside of a young, cancer patient, and to a large audience at Fr. Kunst’s home parish following Mass. 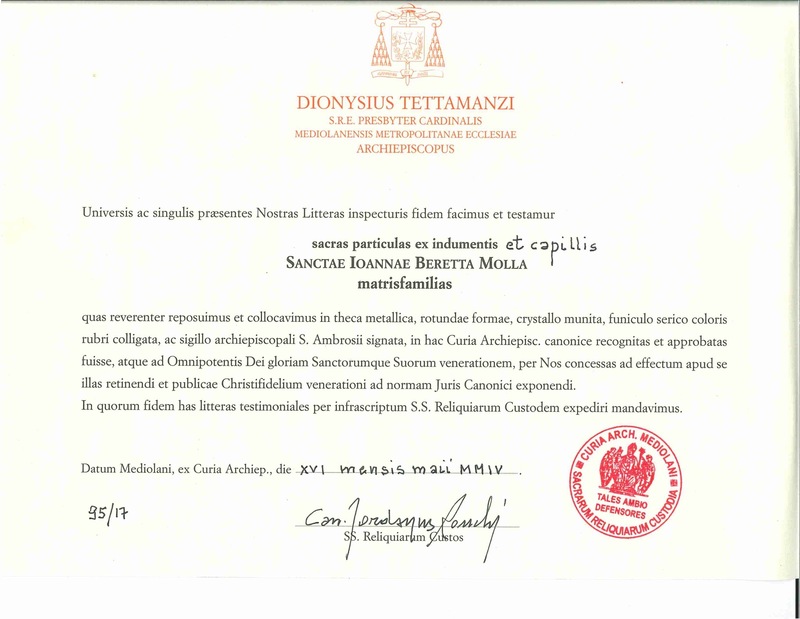 Dr. Molla was received with such great gratitude. This first class relic of her, “Saint Mom” is a treasured addition to the Collection. 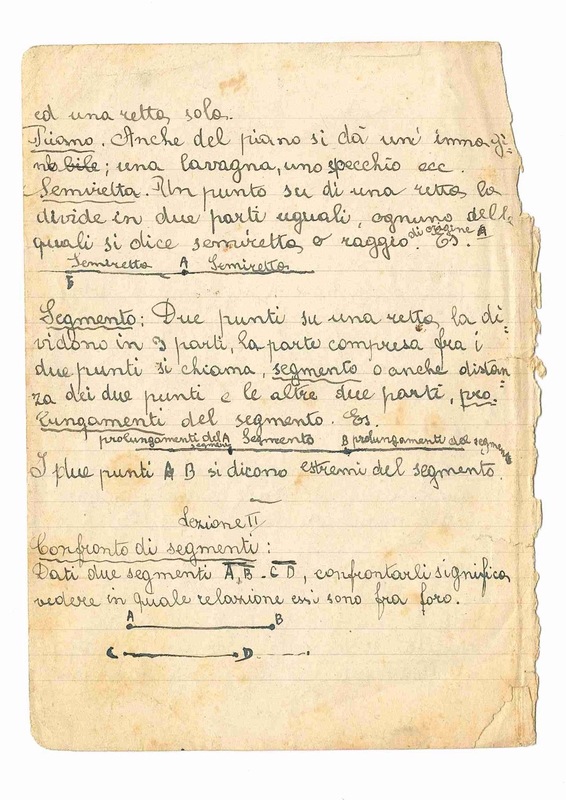 In the Papal Artifacts’ Collection there have been many unique and varied items, and this rare, hand-written Geometry Assignment of St. Gianna Beretta Molla is one of the most unique. 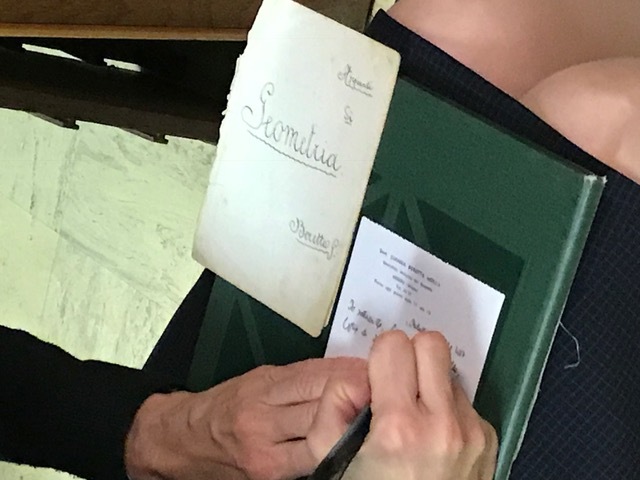 Written as a school assignment in great detail, it was a gift from Dr. Gianna Molla to Father Richard Kunst during her October 29 to 31, 2017 visit to his home parish in Duluth, Minnesota. 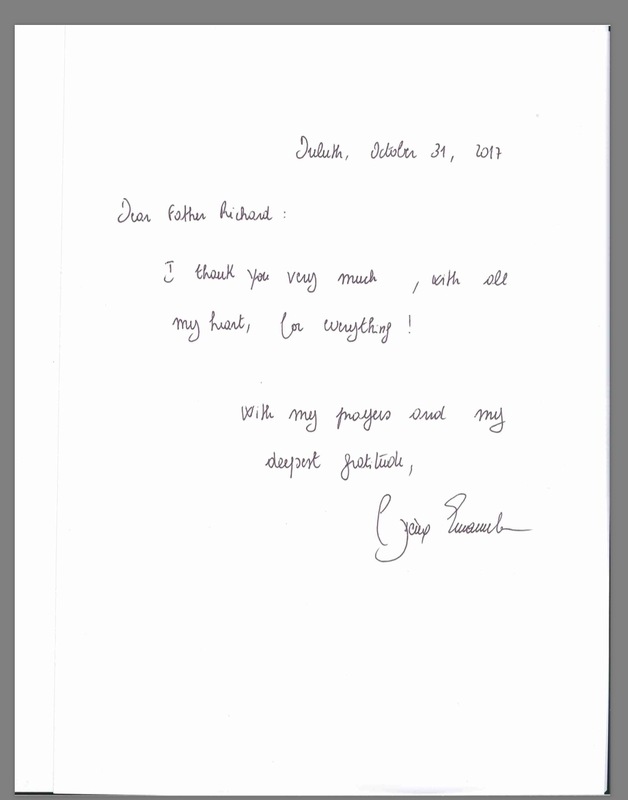 Saint Gianna would have been approximately 14 years old at the time this assignment was recorded. 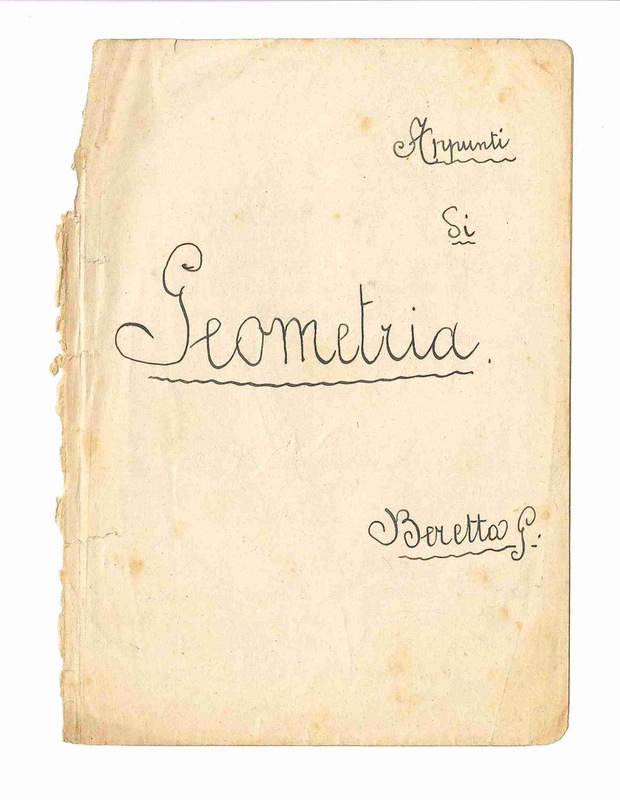 She signed on the cover, Beretta G.
The assignment ranks as one of the most unique treasures of this Collection, coming from a beloved 20th century saint via her gracious and beloved child. 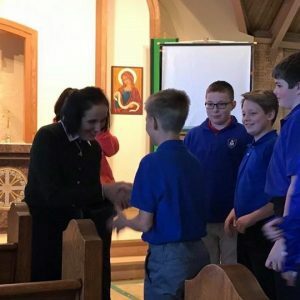 Father Kunst is grateful for this gift, and for the gift of herself, which she left with the audiences who attended her many presentations. 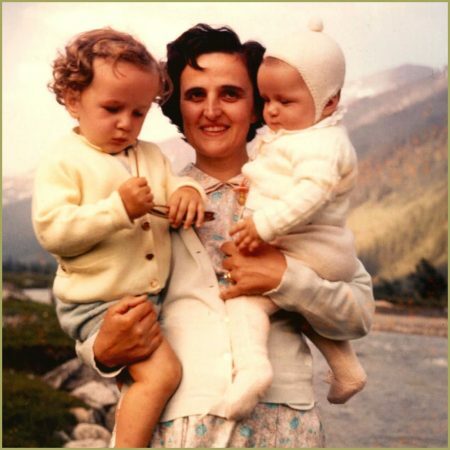 Saint Gianna, pray for us! 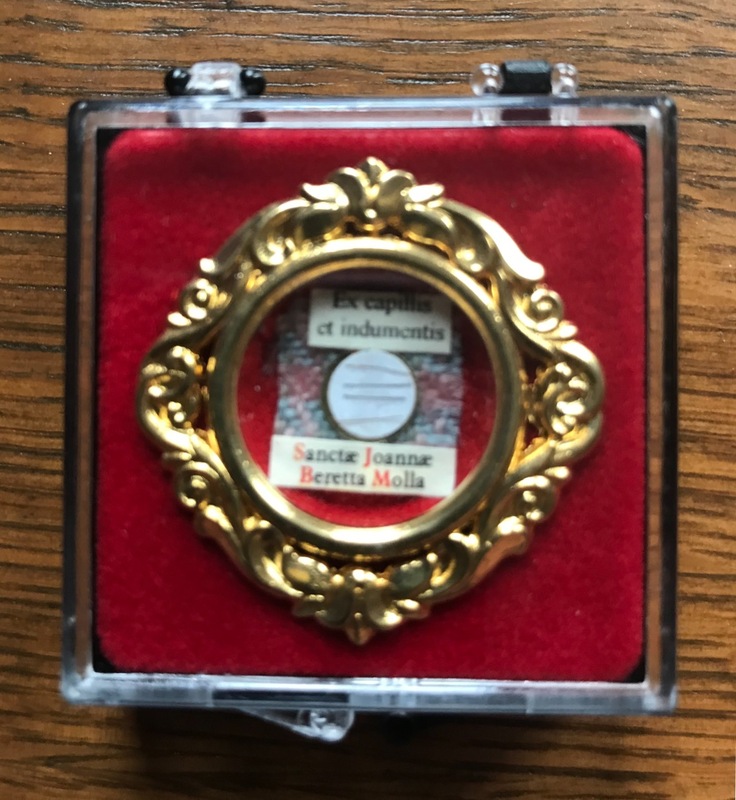 This 2nd class relic of St. Gianna Molla was a gift to Father Richard Kunst from Dr. Gianna Molla, daughter of the saint, upon her visit to Duluth, Minnesota. 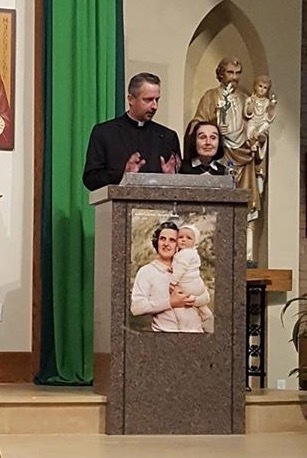 Dr. Molla gave several presentations at Father Kunst’s parish and shared these relics with him. 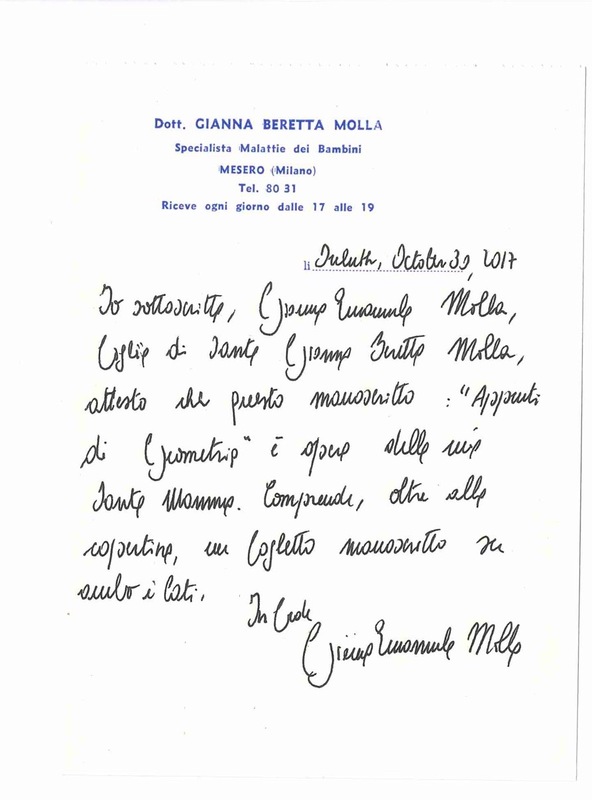 Dr. Molla signed her own name on the side of this card: Gianna Emanuela. 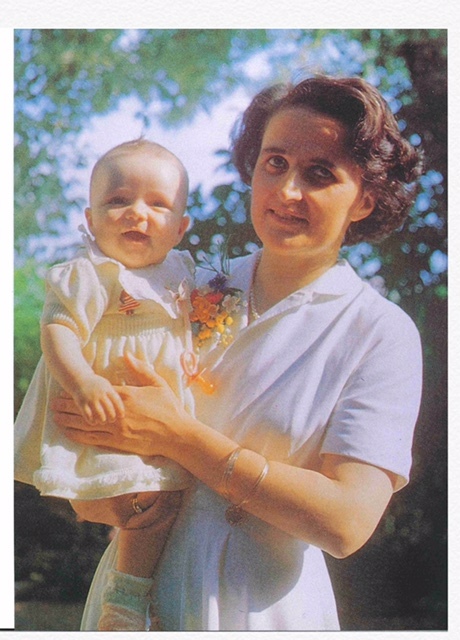 “Conscious immolation” was the phrase used by Pope Paul VI to define the act of Blessed Gianna, remembering her at the Sunday Angelus of September 23, 1973, as: “A young mother from the diocese of Milan, who, to give life to her daughter, sacrificed her own, with conscious immolation”. 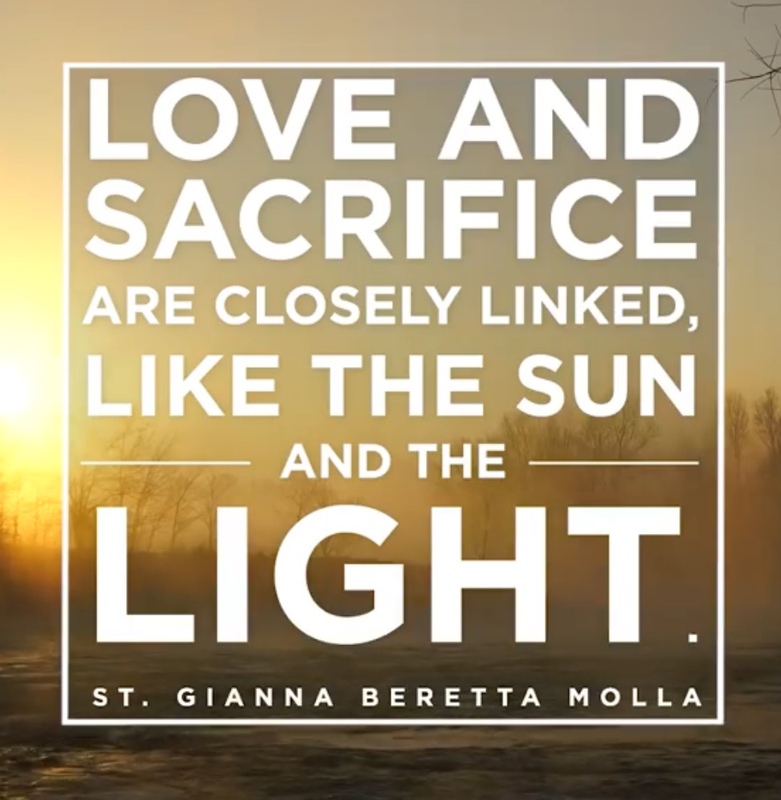 The Holy Father in these words clearly refers to Christ on Calvary and in the Eucharist. 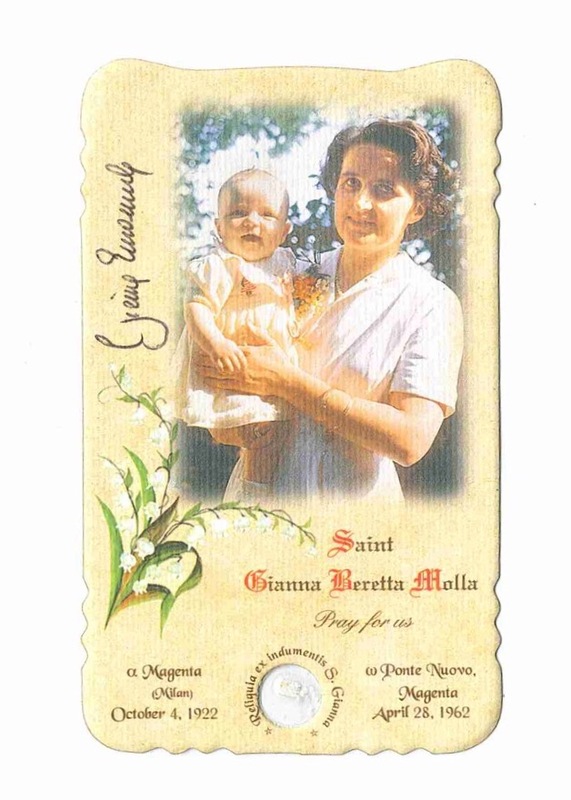 Gianna was beatified by Pope John Paul II on April 24, 1994, during the international Year of the Family, and canonized by him on May 16, 2004. 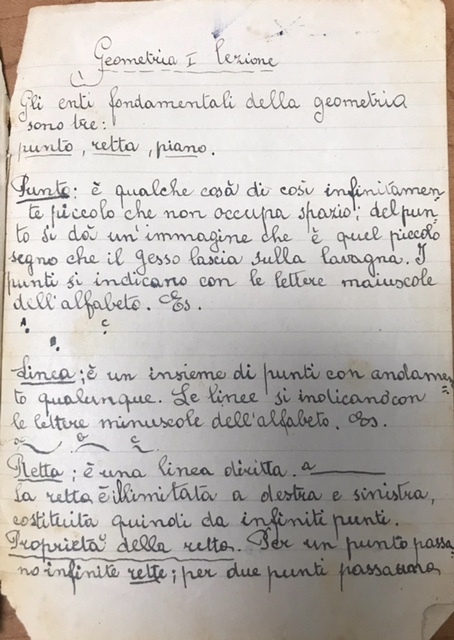 Dr. Gianna Emanuela Molla practiced as a Geriatrician as the Geriatric Institute “Camilo Gulgi” in Abbiategrasso, Milan. In 2003, she left her profession to care for her father, Pietro, who had serious health problems until he died on April 3, 2010 at the age of almost 98. It is impossible to overestimate the gift to Duluth, Minnesota, Dr. Molla was. 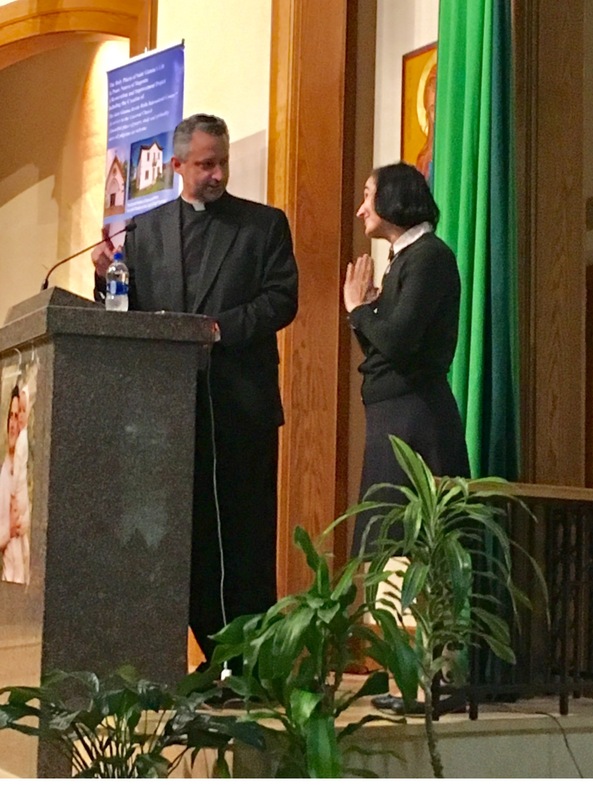 Her indescribable joy and heartfelt presentation about her Saint Mom and Holy Dad reached into the hearts and minds of those who were fortunate to hear her presentations. We are so grateful for her presence. 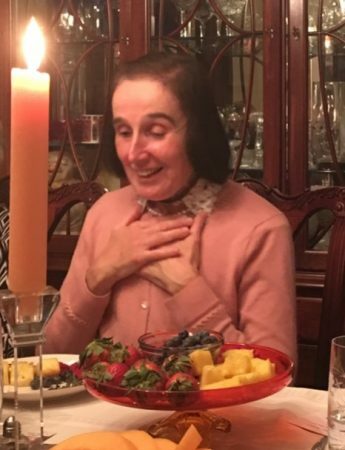 Dr. Molla exuded such joy during her visit to Duluth, Minnesota. 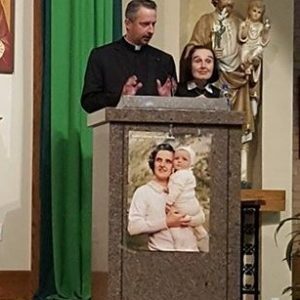 She gave this 8 X 11 photo of her, “Saint Mom” to Father Kunst as a gift in gratitude for the generosity and hospitality she enjoyed while here.